Maker of the industry-leading noise abatement product "Quiet Steel"
Material Sciences Corporation (MSC) began a unique collaboration with fellow sound/vibration industry specialists Brüel & Kjaer and Link Engineering to create the ultimate center for research on noise and vibration as it relates to durable goods products. Mission accomplished. Now, how do you get the word out to encourage product development engineers in various industries to take advantage of this resource to help make their products quieter? Assigned to handle publicity and marketing support for the launch of the center, we set up press visits for a "Grand Opening", contacting the local/regional business press as well as automotive and manufacturing technology media. We also produced the initial sales literature and guidebook for the event. There was plenty of “noise” in the business and trade press, and on Detroit-area radio. PR results included a front-page story in Crain’s Detroit Business, two covers in the leading trade publication, and many other hits. 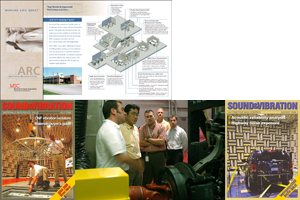 Our team also provided PR services to MSC to promote their automotive industry-changing product, Quiet Steel®.